Shortcuts are individuals and companies that function like lifelines to the people and organizations that most depend on them. They are available when needed, they humbly perform tasks without complaint, they are masters of their own specific skill, and they always present a positive attitude. Great Shortcuts are able to make time for things about which they are passionate. They use that same efficiency and passion in the workplace, making other people's jobs easier, creating a better experience for colleagues and clients, and helping colleagues increase profits or cut costs. On the road to professional success, there are no shortcuts to excellence. But when you become a Shortcut in the workplace, you carve out the straightest path between you and your ultimate goal. 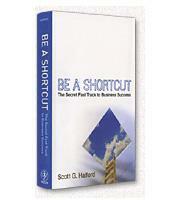 How the winners in financial, personal and spiritual endeavors use shortcuts. The shortcut goal: Make it easier, make it better, make more money. The shortcut role: Delight the customers while getting them what they need. How to become a superstar shortcut with the 21-day training model. What areas your organization can focus on to create a Shortcut Culture. The temptations that can sink a business.